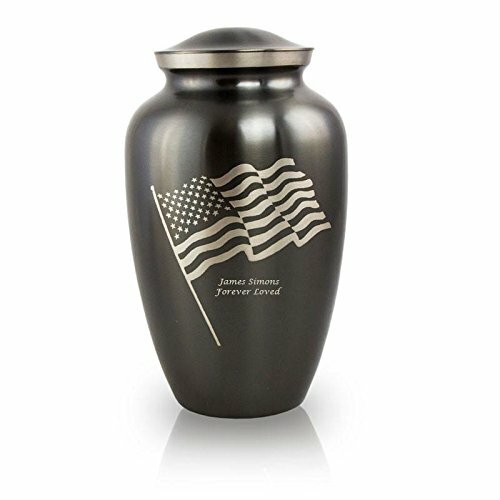 Brass cremation urn for ashes with a slate finish that includes an engraving of the American flag waving in the wind. A wonderful way to honor a beloved veteran. Capacity: up to 210 cubic inches. Engraving included. Brass is a lightweight metal alloy made of 90% copper and 10% zinc. It gives off a bright golden appearance when polished. Oftentimes, brass cremation urns are finished with bronze or pewter to strengthen the brass and to alter the color. The bronze finish has a more reddish hue, whereas the pewter finish gives off a silver hue. Brass is also easy to cast in a mold as it is a malleable material that can be coated in enamel or paint. It is used in multiple capacities for a wide variety of purposes and has a long history as a favored material for everything from cookery to fine art to metal cremation urns. Our brass cremation urns showcase the fine balance this diverse material offers. The beauty and functionality of brass have given it a high standing among metals and alloys, and it is among the most popular choices in our large selection of cremation urns for ashes. Know the approximate weight of the deceased person or pet in order to select the correct size. The industry standard indicates that one cubic inch of urn capacity is required for one pound of body weight. By way of example, a person weighing approximately 150 pounds will need a cremation urn of at least 150 cubic inches. Therefore, incorporate the weight of the deceased into this formula: 1 pound weight = 1 cubic inch. Select the urn size by specifications of size in cubic inches. These specifications are listed on each product page. Brass cremation urn for ashes with a slate finish that includes an engraving of the American flag waving in the wind. A wonderful way to honor a beloved veteran. Capacity: up to 210 cubic inches. Dimensions: 10.40 Inches High, 6.10 Inches Wide. Capacity: Ideal for a body weight of up to 210 pounds prior to cremation. Engraving included in purchase price. If you have any questions about this product by OneWorld Memorials, contact us by completing and submitting the form below. If you are looking for a specif part number, please include it with your message.